In genealogy research, three major categories of errors are encountered: recordation, transcription, and misinformation. The most challenging documents will be those prior to the 20th century. Recordation errors occur when the recorder misunderstands the information relayed, misspells information, or is given incorrect information. Transcription errors occur due to illegible handwriting, decaying or damaged documents, and lack of knowledge of the document's subject matter. Misinformation occurs in every type of recorded document, not just in historical documents, but even in today's world of technology and communication overload. Some is intentional, some is not. The good news is that the accurate details are usually apparent somewhere along the trail of lifetime records. Census records offer the most comprehensive story of one's life. Each U.S. and state census gathered different information, and every type of error can be found in these records. For these reasons, census records will be used for demonstration purposes in this article. Census records are available for searching and reviewing on subscription-based and free websites. Check local public, genealogy, and historical libraries for available census collections. The Church of Jesus Christ of the Latter-Day Saints claims the largest genealogy organization in the world. Their free access website can be found at familysearch.org. The National Archives houses all of the U.S. census records on microfilm, which can be accessed at National Archives facilities. For more information, see National Archives. There was a time when many adults in the United States lacked education, especially in farming areas where working the farm and feeding the family was the key to survival. As a result, many could not read, write, or spell their own names, and did not know when or where they or other family members were born. People migrated across the United States, sometimes living in several places before finally settling down. There were births, deaths and marriages along the way. New cities were being established, and county and state boundaries changed frequently. In states where efforts were made at recording vital events, many were not officially recorded for months or years. People changed surnames to distance themselves from family or for other reasons. Acquiring the Civil War records of one of my ancestors confirmed that his parents had changed their surname from Burklow to Burtlow. As more and more immigrants arrived in the United States, language barriers grew and unfamiliar names and spellings were being introduced across the country. Many anglicized both first and surnames, because their given names were difficult for other cultures to understand, or to signify new beginnings in America. My ancestor, Andreas Huber, changed his name to Andrew Hoover. Tracing the European origins of my family would have been very difficult had this information not been known to descendants. Someone present in the home when the census taker arrived provided information for the entire household. If a literate household member was not available, the census taker had to determine spellings. If no one was home and the census taker knew the family, he might complete the census form based on his own knowledge. Recording name variations and nicknames were common, such as Charles or Chas, William or Wm and Rebecca or Becky. Rebecca may also have been spelled Rebeca, Rebeeca, Rebekah, Rebekkah, or Rebeckah. And there are instances where only first and/or middle initials were recorded. Cultural and language barriers also added to the challenges. Inaccurate information was intentionally given to a census taker. There is a Native American Indian in my family, but every census record indicates she was white. The stigma of divorce sometimes caused a woman to indicate she was married, although there was no husband listed in the household. I have found children of a deceased father listed with the surname of the mother's current husband. Some instances of misinformation are very apparent as in the image below of the 1880 census from Davidson County, Tennessee. One household lists the families of Ben J. Woodson and George D. Howard. Old West history buffs will recognize them as Frank and Jesse James! The majority of census documents are very legible. However, some present transcription challenges due to penmanship, damage, or age. This is a short synopsis of the errors most likely to occur in census and other records. Armed with this information, we can now determine the best manner in which to locate these records. Understanding how to use databases is primary in overcoming errors. Educate yourself on the use of wildcards, phonetic or "sounds like" tools, and other search factors in databases. Subscription databases should offer a learning center for this purpose. Free sites should contain a simple explanation or assume some knowledge of the use of databases. In tracing a family line in Iowa, I encountered "all of the above" challenges, many in tracking one of the daughters, Elizabeth, who married William F. Woodward. In census records spanning the years 1860-1905, William and Elizabeth were listed as: Wm F. and Elizabeth; W. F. and Mary E. Howard; W.F. and E.; William F. and Mary E.; Lizzie; and Mrs. W. F. Woodward. Some of the children's names varied from census to census as well - Isaiah C. and J. Carson; Andrew, A.K. and Andrew C.; and Charles W., Chas M. and Charles M.
There were additional challenges tracking this family, among them Elizabeth living with a married daughter in Kansas following William's death. Multiple searching on every family member and scrolling through lists of records was required to find all available census records. 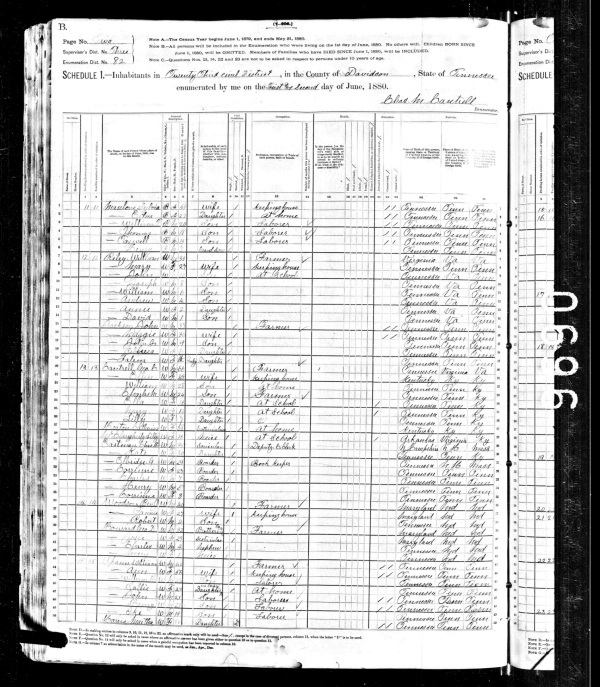 In addition to using the searches above, look for neighbors and relatives from previous or more current census records. You may find your family still living nearby. Databases and other website information contain someone's interpretation and transcription of records. You do not know the accuracy of this person's interpretation or their knowledge of the subject matter. If you do not have access to the actual document, assume there are errors if the transcription does not make sense in the context of your family. You also do not know what generation copy or scan is being viewed by you or a transcriber. If there are any doubts about the translation of a document, continue to search for better-quality copies in other locations. Transcriptions may be different from one website to another. 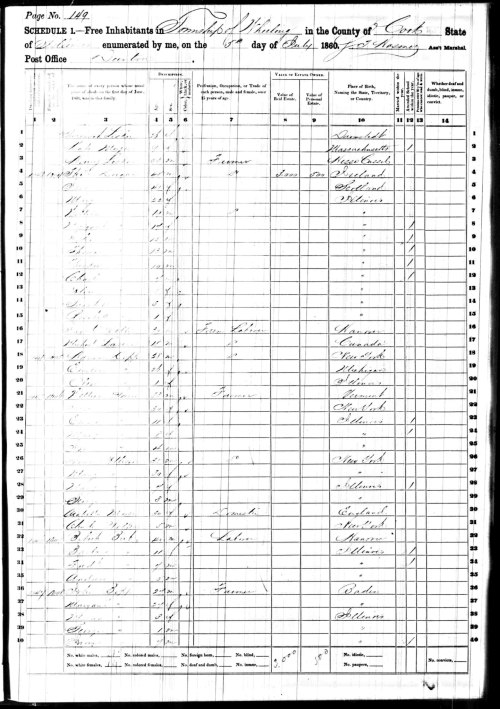 See the image below of the 1860 U.S. census for Wheeling, Cook County, Illinois. Using a wildcard in the surname located this record, which contained one incorrect letter in the transcription of the surname. Comparing records will identify the inconsistencies and help determine the most accurate facts. Birth, marriage and death records may contain the most accurate information for comparison purposes. Actual copies of these types of documents are not so easy to access. There is a plethora of information on the internet containing partial indexes and translations of vital records. (If ever there was a perfect example of "plethora", it is on-line genealogy sources!) Illinois has a fantastic public document repository and website for the Illinois State Archives, including some on-line marriage and death indexes for genealogy researchers at cyberdriveillinois.com. Missouri also has a wonderful website, Missouri Digital Heritage. There are over 2 million death records and death certificates available for viewing. Regardless of corroborating evidence, it is difficult to say with 100% certainty that historical data is the truth of what actually occurred. Can you really separate fact from fiction with these records? The truth of heritage is not necessarily found in historical records -- the historical records have become the truth of heritage.